A WebCGM 2.0 instance, as shown in Figure 1, consists of a single Picture. Properties which apply to the whole metafile are defined in the Metafile Descriptor. These include descriptive information about the metafile, the precisions of numbers, as well as identifiers for fonts and such resources. Properties which apply to the elements in the body of the picture are contained in the Picture Descriptor. These include such information as picture size and scaling, specification modes for aspects such as line width, and background color. Because WebCGM 2.0 allows only a single picture per metafile, the distinction -- whole-metafile versus picture-specific -- may not seem useful. However, because a WebCGM 2.0 metafile must be a valid ISO CGM:1999 metafile, the ISO CGM:1999 metafile structure is observed. WebCGM 2.0 also defines a purely graphical grouping mechanism, "graphical node", which groups graphical primitives as an Application Structure, but disallows the attributes or properties that associate intelligence with objects. CGM supports both raster and vector graphics in the same picture. WebCGM permits the use of popular raster compression methods — CCITT group 4, JPEG, and the deflate (LZ77 derivative) method of PNG — for raster content embedded within the picture. For information about scaling of WebCGM pictures in Web documents, see section "WebCGM and the object element". Primitives which have a value for the registered Escape 45 other than fully opaque, have the effect of producing a temporary separate canvas initialized to transparent black onto which the primitive is drawn. The canvas is then composited into the background, taking into account the Escape 45 value. The presence of APS in the primitive list has no effect on the rendering. No temporary canvas are created. It is identical to the case of no APS. This may be handled in two ways with WebCGM. First, the " background" param element within the object element may be used (see section "WebCGM and the object element"). Second, the registered Escape 45 (alpha transparency) element may be included in the Picture Descriptor and applied to the background color of the picture. 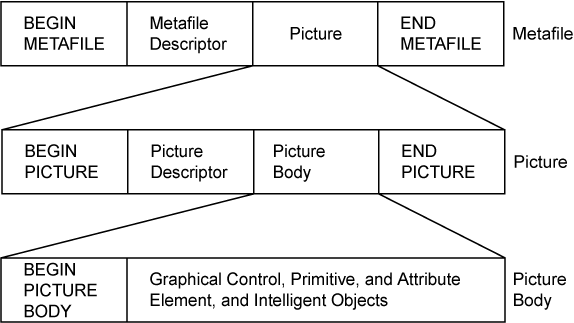 To meet the requirements of intelligent graphics, four specific group types are defined and allowed in WebCGM: 'grobject', 'layer', 'para', and 'subpara'. 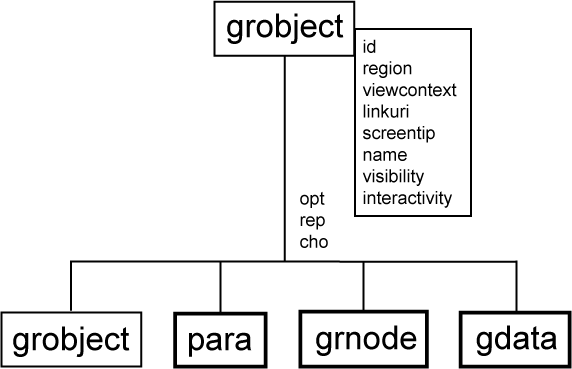 WebCGM 2.0 allows a fifth group type, 'grnode', as a convenience for authoring tools to preserve their graphical grouping functions. The detailed normative syntax and semantics of the group types, including viewer behavior, is defined in Chapter 3 and in the PPF. Below is a brief conceptual summary. 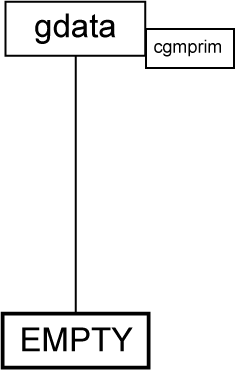 Throughout Chapter 3, WebCGM normatively defines a detailed content model for the V4 content in the form of an "XML fragment". See section, "WebCGM Content Model", for an informative (non-normative), all-at-once presentation of the content model. Note. 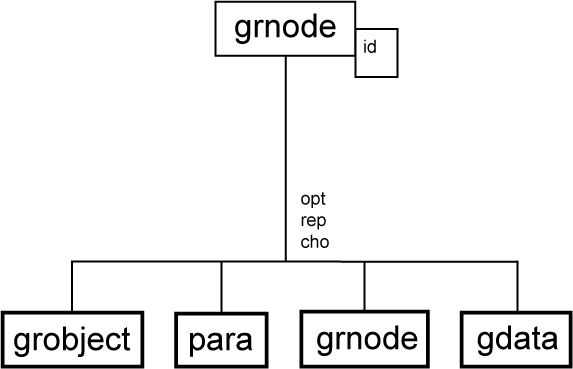 'Grnode' was not present in WebCGM 1.0, but has been added to WebCGM 2.0 to allow for better hierarchical structure in WebCGM documents. 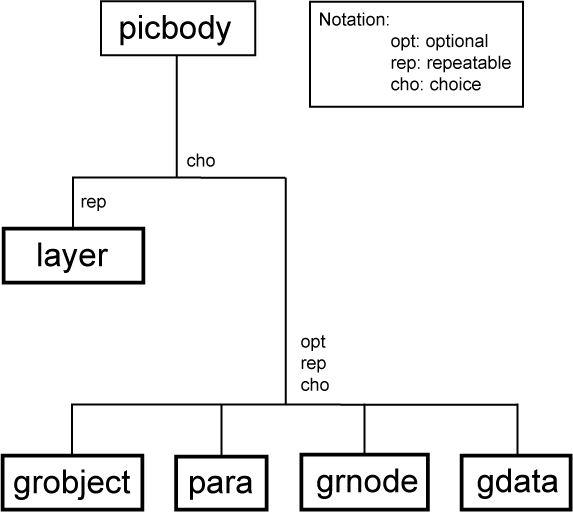 The 'grnode' ("graphical node") APS allows for preservation in the WebCGM metafile instance of the graphical grouping facilities that are typical in illustration authoring tools. name — a "common name" attribute to be associated with object, that gives a useful search handle or way of defining searchable subtypes of the object type; also allows a group of same-name objects to be a link target. visibility — the 'visibility' attribute indicates if an object is visible (drawn) or not, and also potentially disables its eligibility to be picked (invisible objects are ineligible for picking). The detailed normative syntax and semantics are presented later (Chapter 3) in this specification. The structure and relationships of the intelligence content are illustrated in the following diagrams. In the following, "picbody" is not a specific WebCGM object type, but rather a convenience to refer to that part of the CGM picture which is between the Begin Picture Body element and the End Picture Element, exclusive. Boxes with heavy borders indicate elements that are decomposed further, and offset boxes indicate attributes associated with an element. Similarly, gdata is not an object type, but rather a catch-all reference to zero or more CGM graphical elements which WebCGM allows, and which are valid at such a position according to the rules of CGM. The cgmprim attribute associated with gdata represents an entity that associates the graphical primitives to the model. See Figure 2. The <pict-part> is identified by a keyword and has two pieces, the picture locator (either the 'PictureId' string parameter of the CGM, or the picture sequence number), and viewer behavior upon navigating to the picture. With the WebCGM 2.0 restriction of one picture per metafile, the <pict-part> is not useful in purely 2.0 environments, but is maintained in the syntax for backward compatibility with WebCGM 1.0 metafiles and WebCGM 1.0 implementations. The syntax is well-defined so that in many common cases, keywords and pieces can be eliminated and defaulted. So, for example, <base-URL>#<string> unambiguously identifies the object (APS) whose Id parameter is "<string>" in the first (only) picture of the metafile pointed to by "<base-URL>". ISO CGM defines two encodings of the CGM functionality: Binary, and Clear Text. WebCGM, like other leading industry profiles of CGM, limits the encoding to Binary for the purposes of conforming interchange. It is the Binary encoding which is registered as a MIME type. Using available encoding converters, the Clear Text encoding can be used for debugging, hand authoring, demonstration, etc. WebCGM 2.0 includes most of the significant of the graphical drawing primitives of CGM:1999.
and the compressed, tiled Tile Array capability of CGM version 3. The popular Web compression formats of CCITT Group 4, PNG, and JPEG are among the supported compression types. Polysymbol - the Polysymbol element allows the sizing and placement into CGM pictures of "symbols", which are defined in an external Symbol Library (which itself is a CGM). The appearance of graphical text can be controlled by the CGM attributes of font and character set (which corresponds to character encoding in the proper terminology of Character Model for the World Wide Web 1.0: Fundamentals [CHARMOD], see later), text size, orientation, inter-character spacing, expansion-compression of nominal character aspect ratios - the important aspects needed for precise control in modern graphical text presentation. The orientation attribute actually give control not just of rotation, but skewness and aspect distortion, i.e., it is equivalent to a local transformation on text elements. WebCGM 2.0 also supports the Generalized Text Path capability (text on arbitrary, curved paths), with the style (Generalized Text Path Mode) limited to 'axis-tangential'. The following attribute and control features of CGM:1999 are excluded from WebCGM 2.0. First, a WebCGM picture can be placed with transparent background via the TRANSPARENT parameter of the OBJECT tag. Second, per-element and per-pixel translucency (on a continuum between fully opaque and fully transparent) can be defined via an alpha-transparency Escape element specified in the ISO Register of Graphical Items. The default character encoding ("character set" in the archaic terminology of the original CGM:1987) is ISOLatin1. This default is mandated by the ISO CGM:1999 standard. The WebCGM XML Companion File (XCF) is a new significant new component of WebCGM, forecast in 1.0 and added in the 2.0 upgrade. The WebCGM XCF provides a standard way to externalize metadata from a WebCGM instance, while maintaining a tight binding of that metadata to objects (APSs) in the WebCGM instance. The normative definition of XCF includes a base and generic DTD. The WebCGM XCF is designed to be extensible, by other profiles derived from WebCGM 2.0, as well as applications of WebCGM 2.0. In particular, this allows industry specific metadata to be added to the WebCGM object model. See the normative XCF definition for details. An interface for programmatic access to WebCGM contents and structure, as well as facilities to manipulate a standardized WebCGM XML Companion File, were perhaps the strongest driving requirements for the upgrade of WebCGM 1.0 to WebCGM 2.0. Virtually all of the WebCGM viewer and user agent implementations had already defined and implemented a proprietary application programming interface (API) for such functionality. 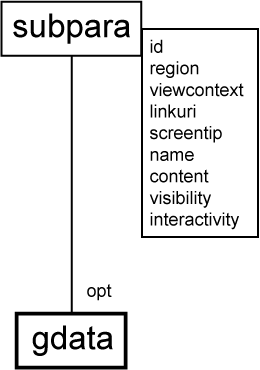 Such an interface is part of a Document Object Model (DOM) for WebCGM. The functionality available in the WebCGM DOM is somewhat more limited. 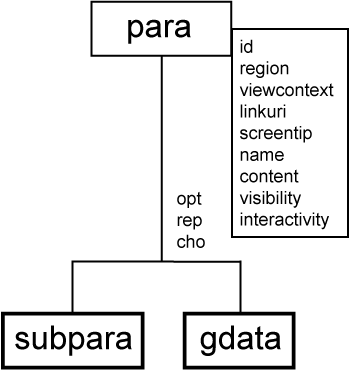 The WebCGM DOM exposes the document graphic structure down to the Application Structure (APS) level -- APS's are the fundamental addressable graphical objects in WebCGM, and are the building blocks of the hierarchical structure tree of a WebCGM. The WebCGM DOM supports transient manipulation of the APS attributes -- which represent non-graphical metadata associated with the objects -- and transient changes to presentation style of graphical objects. The WebCGM DOM therefore provides the functionality to query and discover the structure of a WebCGM, enumerate its graphical objects, extract associated metadata (e.g., hyperlinking data) from documents, and finally provides users with standard ways to add more interactivity to WebCGM documents than was possible in WebCGM 1.0. The WebCGM DOM also provides functionality for manipulation and application of standard WebCGM XML Companion Files, described in the previous section. The WebCGM DOM supports a number of usage scenarios and gives access to a number of useful capabilities -- see the WebCGM 2.0 Requirements for details about the in-scope and out-of-scope capabilities of WebCGM DOM.